Each day we eat and drink things that can easily stain our naturally white smile. Drinks such as coffee, red wine, tea, soda, and sports drinks can cause teeth discoloration. Certain foods such as berries, grapes, and candies can also turn your pearly whites a different shade over time. 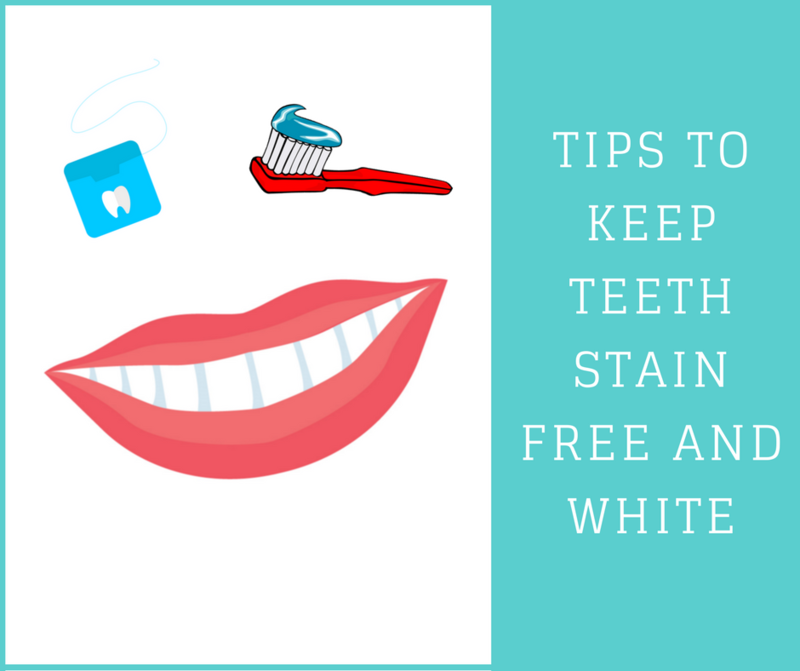 Here are a few tips to keep your teeth white and your smile confident. This may seem like a no brainer. You should be brushing your teeth at least twice a day. However, if you eat or drink something which could stain your teeth, then a quick brush right after can help fight against any stain causing agents. This is one task that many people skip. However, flossing is just as important as brushing when it comes to keeping your teeth and gums healthy and clean. Flossing can also help keep your teeth white. How? Plaque build up attracts stains. By flossing on a regular basis, you are getting rid of plaque and keeping it from building up; therefore, you are preventing stains that can change the color of your teeth. If you are truly worried about a drink possibly changing the color of your teeth, then try using a straw. By using a straw, you are sending liquid to the back of your mouth. Not only is drinking more water better for your body but it is also great for your teeth. Drinking water with and in between meals is a great way to wash away stain causing food and drinks. When you can’t get your teeth the shade of white you desire, you can get them professionally whitened. Dr. Reese uses a tray whitening system known as Kor Whitening. There are three different levels of this teeth whitening system to help you achieve the level of white you desire. Whitening trays are custom fabricated to fit each individual’s mouth in order for the trays to be sealed at the gum line. This prevents bleach/teeth whitening product from leaking out and saliva from getting into the trays. Visit our Whitening and Bleaching page to learn more about the Kor Whitening system and why it’s considered the most reliable and effective whitening system developed. If you are looking for a dentist in Mountain Home, Arkansas, Reese Family Dentistry is a great choice for the entire family. Our office provides a complete line of services including teeth whitening, routine dental exams, orthodontics, dentures, and so much more. Give us a call at (870) 424-5900 or REQUEST AN APPOINTMENT online by clicking here.